Rep. Job Tate (R-Mendon), standing, proposes cutting legislative pay during debate on the budget bill Friday on the House floor. House members used up all their spit and fight in close votes Thursday over how much money the state should raise and spend. By Friday, opponents of the bills were left grasping for ways to make a point. They didn’t have much success during a long day of lopsided votes that shot down challenges to both the budget and tax bills. The House passed the $33 million tax bill by a 90 to 53 partisan vote. The $5.5 billion budget bill passed by a voice vote at 6:15 p.m. Both bills go next to the Senate. The sharpest point Republicans tried to make came late in the afternoon, with a proposal that would have cut only $180,000 from the state budget but struck close to home. Rep. Job Tate (R-Mendon), a first-year member, proposed cutting legislators’ pay by 7.5 percent. “This bill is very simple. It gives us a pay cut,” Tate said on the House floor. He said legislators, who are slated to make $690 a week in 2016, would lose the weekly equivalent of an entrée, tax and tip at J. Morgan’s, the restaurant across State Street from the Statehouse. Rep. Paul Dame (R-Essex) pitches a plan to cut legislative pay to the House Appropriations Committee on Friday. House Appropriations chair Mitzi Johnson (D-Grand Isle) said the budget bill calls for reductions in the legislative budget along the same lines as other state agencies. Rep. Oliver Olsen (I-Londonderry) jumped in with a substitute amendment. Legislators could take a voluntary pay cut and designate which state program they want the savings to go to. Olsen won enough support to boot Tate’s amendment out of the way, then stood by as legislators defeated his own amendment. The net effect was to upend Tate’s effort. It was worth it, Tate said, even though by the end of the day he apologized on the House floor after a comment he made that anyone should be able to absorb a modest pay cut didn't go over well. Republicans, who have 53 of the chamber’s 150 seats, got out-polled all day Friday, however. 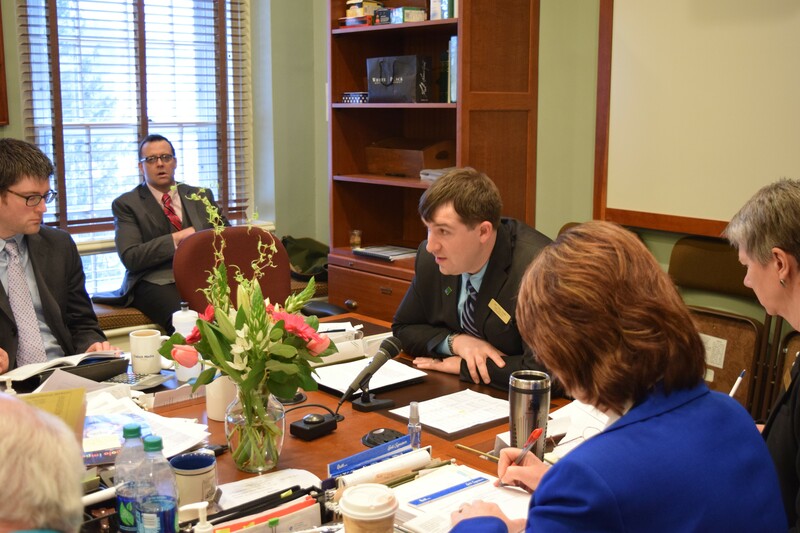 Rep. Tom Burditt (R-West Rutland) tried to change the budget bill so that it would more firmly insist that state agencies plan ahead with their budgeting. Instead, the bill called for creating “an ongoing expectation” of planning ahead. If lawmakers are serious about making more sustainable budgets, they should be willing to say so, Burditt said. His effort failed by a 95-41 vote. 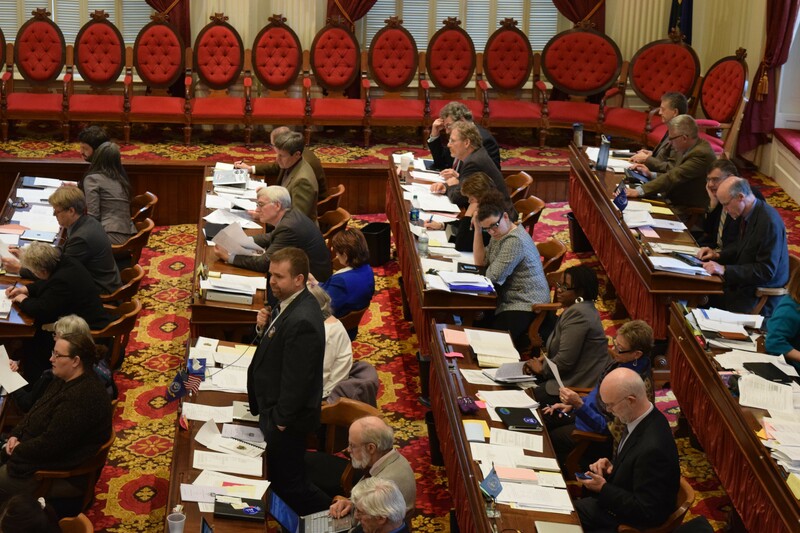 A series of Republican amendments on the tax bill failed on party-line votes as the minority party tried to remove a cap on itemized tax deductions for the lowest-income Vermonters. Each failed amendment proved that the 53 Republicans lacked the power to fight the majority. Republican Minority Leader Don Turner of Milton defended the daylong effort. “We’re going to again put them on the record voting for taxes and spending,” he said.